Convert, save, and share EDB mails to PDF file. Flexible naming conventions for output PDF files. Advanced search options for searching in EDB file. Provision to convert EDB files altogether in bulk. Selectively convert EDB folders/mails to PDF file. Along with EDB to Adobe PDF, the software migrate EDB files in more than seven file formats. 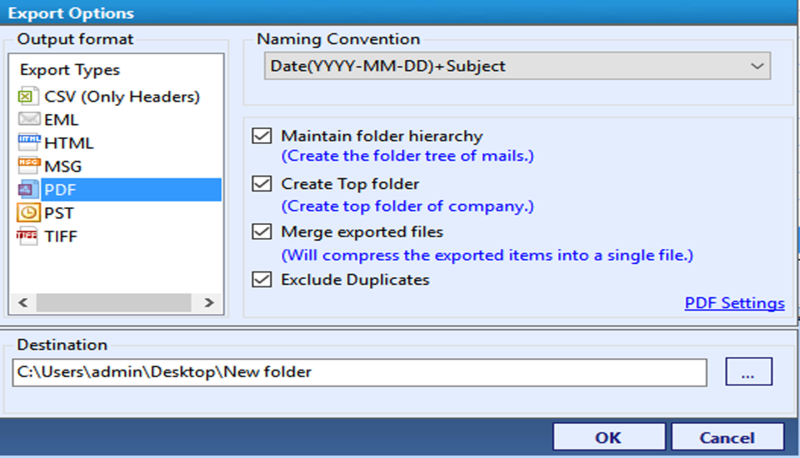 Choose emails files/folder to export. For bulk export option click on export button given in menu bar. Select PDF file in destination and apply filter for desired result. Browse location to save file & click OK. I have been using an internal email management system in my organization. To protect the data from the disaster or any catastrophe which affect the data integrity so I want to take backup of server data to format which is universal in nature. It must be accessible easily on each device irrespective operating system or the device size. I have about 20000 emails to backup with attachments. Is there any option to set the margins of the pdf file? What is the default orientation of resultant pdf file? Can I able to convert bulk edb emails to pdf? How can I set the page layout of adobe pdf documents? Does the software preserve the metadata & integrity of the EDB emails? Are the attachments also get converted with edb emails to pdf? PDF File is the most preferred file format in contrast to the word, tiff etc. Because of its various paranormal features such as PDF files are universal in nature, Adobe PDF files are easily compatible across the multiple platforms such as Linux, Mac, Windows, Android etc. It can compress up to 25% from its original file size. These are some the most glorious features of the Portable Document Format which make the outstanding and usable format for the organizations. When there is demand for transfer EDB files to Adobe PDF format, you must have to use the professional tool like EDB to PDF converter to convert bulk Exchange EDB emails to PDF format. It allows the user to set the margin of PDF documents. Using EDB mailbox to PDF tool you can choose from 23+ default page layouts given in pdf setting option. It sustains the default file structure and data integrity as well. The emails attachment itself embeds in the same file by the EDB file to PDF Converter. Can I exclude duplicate emails in EDB file from being converted to PDF file? 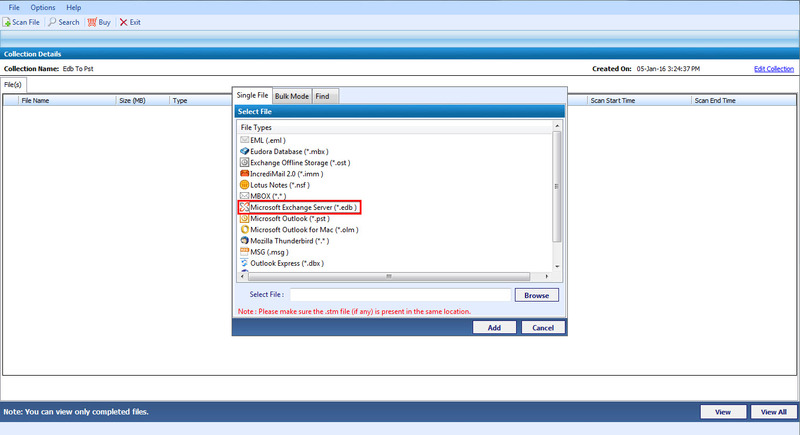 Yes, with Exclude Duplicates option you can avoid converting duplicate EDB mails to PDF format. Will the EDB recovery software convert all the EDB mails in a single PDF file? 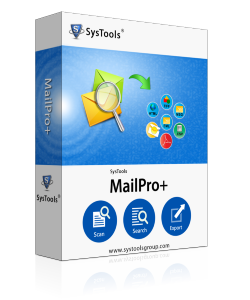 The software can convert the EDB mails to a single as well as can create a single PDF file for each mail. Is there a size limitation on the EDM files that has to be converted? How is the naming conventions option beneficial? EDB to EML Conversion software is a trustworthy and recommendable tool. I liked the interface provided; it took only few minutes for me to understand the tool. All the features of the tool are stunning, but the advanced searching feature is more awesome. It helped me to make my search more easily. Thank you guys for bringing up such a tool to the market ! There are some issues while converting edb to pdf using the traditional methods because you can’t convert multiple edb emails to pdf format. Therefore an automated solution like EDB to PDF Converter is needed to export edb files in pdf format. It provides the most significant features like advanced search option, saves selective edb emails in pdf format & views the content of edb files in 7+ preview modes etc.